Featuring Haydn’s Mass for Troubled Times (Lord Nelson Mass), his Cello Concerto #1, and selections from Copland’s Old American Songs, including Simple Gifts, Long Time Ago, Ching-a-Ring-Chaw and At the River. Performing works of women composers of the last millennium, many of whom have been neglected in performance for centuries. Composers included Princess Friederike Sophie Wilhelmine, Williametta Spencer, Fanny Mendelssohn Hensel, Lili Boulanger and Pauline Oliveros, among many others. Three movements from “The World Beloved:A Bluegrass Mass” by Carol Barnett were performed with bluegrass accompaniment. We commemorated the remarkable story of the World War I Christmas truce, interspersing carols sung by the soldiers and music by German and British composers with descriptions drawn from soldiers’ letters home. Featuring Ariel Ramírez’s Misa Criolla and a wide variety of Spanish- and Portuguese-language music throughout the ages. We sang Ralph Vaughan Williams’ 1936 peace cantata Dona Nobis Pacem, accompanied by piano and string orchestra. An assortment of Vaughan Williams folk songs for strings and voice opened the concert. Featuring Bob Hurd’s Misa del Pueblo Inmigrante, a charming Mummer’s Play, Franz Biebl’s Ave Maria, Eric Whitacre’s Alleluia, and Franz Schubert’s Benedictus es, Domine — with many other joys besides. We celebrated the peak of our 50th season, and the beginning of the Maverick Concert Hall’s 100th season, by performing Mozart’s hauntingly brilliant Requiem with chamber orchestra and vocal solists at the Maverick. The first full performances of MDT since 2009 were presented at Christ Episcopal Church in Poughkeepsie and Woodstock Jewish Congregation. This special program of music and spoken word at Old Dutch Church, Kingston, was offered as a gift to the community. Our audience generously donated over $1300 to support Caring Hands Soup Kitchen in Kingston. The 19th annual celebration of the season continued the tradition of combining diverse styles of music into a single musical fabric. The music ranged from Henry Purcell’s harrowing “The Cold Song,” through the warmth of hearth and friendship in “Winter’s Coming Home” by the monks of Weston Priory, to the whimsy of P. D. Q. Bach’s “O Little Town of Hackensack” and “Good King Kong Looked Out” — to name a few. A concert celebrating the Hudson Valley’s Musical Legacy, including 19th century shape note songs of Lewis Edson and Lewis Edson Jr. of Shady, Native American prayer and music, music inspired by historical events, folk music of Camp Woodland, music written by Ernest Williams of the Saugerties Band Camp, and compositions of celebrated musicians and performers who have made the Catskill Mountains their home. An all-baroque music concert featuring the chorus, soloists and the Ars Choralis Chamber Ensemble performing Bach’s Cantatas Nos. 61 and 191; Erica Pickhardt playing his unaccompanied Cello Suite No. 2 in D Minor; and Voices of Tomorrow honoree soprano Libby Sokolowski singing Sheep May Safely Graze from his Cantata No. 208. Additional works by Buxtehude, Lotti, Graun, and Giacomo Puccini completed the program. World premiere of Barbara Pickhardt’s and Johanna Hall’s Miracle in Bethlehem. Performed for overflowing audiences at Overlook Methodist Church in Woodstock, NY, this musical telling of the Christmas story featured the 45-voice chorus, 14 soloists and a chamber ensemble of violin, cello, piano, percussion, flute and trumpet. 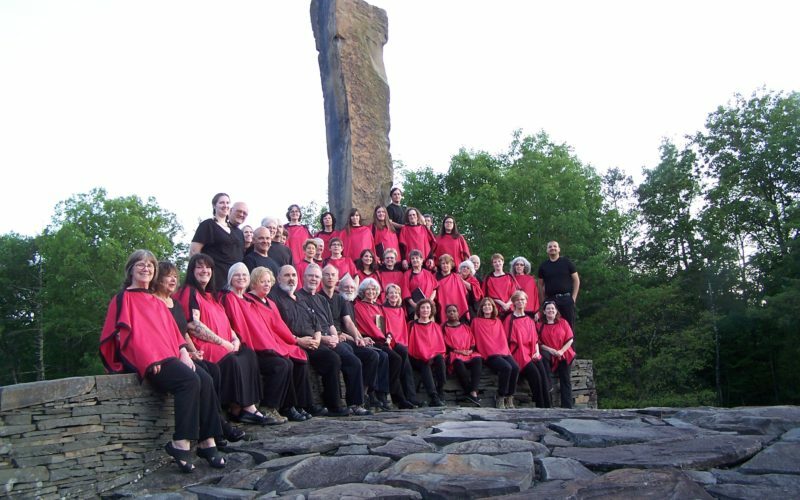 As part of the Big Read program organized by the Poughkeepsie Public Library, Ars Choralis performed excerpts from the Music in Desperate Times program at the Bardavon Theatre in Poughkeepsie. Carl Orff’s Carmina Burana was performed outdoors in the amphitheater of the Opus 40 Sculpture Park by a full complement of choristers, soloists, children’s choir, duo-pianists and percussionists. The extraordinary artistic and natural beauty of Opus 40 and the imaginative use of its many levels and unusual singing locations made for a uniquely dramatic performance of Orff’s celebrated masterpiece. The Road to Freedom: A Tribute to Martin Luther King, Jr. In celebration of the life of Dr. Martin Luther King, Jr., Ars Choralis performed “The Road to Freedom,” a concert of remembrance. The concert followed in the words and music tradition of earlier Ars Choralis concerts. Narrators read poetry of Paul Lawrence Dunbar and Langston Hughes and excerpts from Martin Luther King Jr.’s sermons, speeches, and “Letter from Birmingham Jail.” Songs, interspersed among the readings, were performed by Ars Choralis and guests, The Riverview Missionary Baptist Church Choir, Nashville soul singer Jonell Mosser, and 12-year-old Carmen Higuita. The concert also premiered three songs inspired by Norman Rockwell’s illustrations of events occurring during the Civil Rights written by Tony nominee Jim Wann. The concert attracted hundreds of people to Riverview Church in Kingston and The Woodstock Jewish Congregation in Woodstock to honor the life of Dr. Martin Luther King, Jr. and to help Riverview Missionary Baptist Church rebuild after a devastating flood from Hurricane Sandy. Read a review here. The seventeenth annual Ars Choralis Welcome Yule Concert featured three centuries of “Glorias.” The concert opened with the “Gloria” from Gounod’s 18th-century St. Cecilia Mass for tenor solo, chorus, brass quartet and organ. From the seventeen century, the chorus sang Antonio Vivaldi’s Gloria with soloists Christina Gardner, Kimberly Horn and Wendy Lowe and the Eribeth Chamber Ensemble. Twentieth century composer Francis Poulenc’s celebrated Gloria with soprano soloist Amy Martin and pianist Kristen Tuttman completed the program. Ars Choralis turned back the clock to the 1940s for Wings of Hope and combined music and words to tell the fascinating story of the historic Berlin Airlift, the first humanitarian mission carried out by air. The true-life accounts of the men who served in the effort, their wives back home and the people of Berlin were interspersed with music. In the musical spirit of the 1940s, Ars Choralis sang a hit parade of songs. Got-to-Lindy dancers were featured swinging to the tunes of the Big Blue Big Band. Inspired by the Aurora Borealis, director Barbara Pickhardt created a musical light show of psalms and Sacred Harp songs, Leonard Bernstein’s “Chichester Psalms,” and St. Patrick’s Day highlights, featuring the Catskill Mountain Renaissance Consort. An array of young talents added luster to the performance: the Woodstock Elementary Chorus, “Voices of Tomorrow” 2012 honoree Katelyn Noecker, boy soprano Morgan Camara, and 12-year-old step-dancer Anna Tuttman. Set in jolly old England, centuries apart, A Tale of Two Christmases visited the courts of two noted monarchs: Queen Elizabeth the First and Queen Victoria. Beginning with medieval chant, a mystery play and ancient carols from the time of Elizabeth the First, the performance fast-forwarded three centuries to a Victorian Musical with a cup-o-wassail, roving carolers, brass music, and Ars Choralis’ own version of Charles Dickens’ story of Gabriel Grub from The Pickwick Papers. From the mystical to merriment — all in one performance! Guest artist Lily Arbisser, the Eribeth Chamber Players, and a stage full of percussionists gathered with Ars Choralis to present a remarkable program of sacred music at the national treasured Maverick Concert Hall in Woodstock, NY. The program included J.S. Bach’s Cantate BWV 84, Ariel Ramirez’s Misa Criolla, the area premiere of Lynn Kurtz’ Sacred Celebration and smaller pieces by Le Jeune, Swider, Weerbecke, Mozart and others. A concert laced with the sparkling rhythms, wonderment and joy of Hispanic Appalachian and African American carols tied together by the remarkable saxophone styling of Robert Shaut and joyous voices of the Hudson Valley Youth Chorale, all summed up in a spirit of unity and goodwill expressed in the words of Maya Angelou’s poem Amazing Peace. Ars Choralis and the Eribeth Chamber Players joined forces to bring both Mozart’s famous Eine Kleine Nachtmusik and his less familiar Dir, Seele Des Weltalls to life. Three unknown motets and the popular Regina Coeli in B-Flat completed the program. Benjamin Britten’s Ceremony of Carols opened the concert, perfectly blending the archaic Old English language with a contemporary musical setting. Through the magic of Dylan Thomas’s poetry, A Children’s Christmas in Wales, glimpses of holidays past were brought to life and illuminated by the songs of Ars Choralis and tunes of guest artists Celtic Crossing. A German Requiem, Op. 45, in the original London version with piano four-hands, plus String Sextet number 2 in G MAJOR, Op. 36. Third series of performances at Cathedral Church of Saint John The Divine, Manhattan and in Berlin Germany. A choral concert set in the Holocaust featuring a small reconstruction of the Women’s Orchestra that played in the Camp at Birkenau during WWII. Their story was told with readings from their memoirs and histories, along with representative orchestral selections and choral commentary. Musical portraits of Christmas scenes through the ages. The concert featured ancient carols performed by The Catskill Mountain Renaissance Consort, the Medieval Liturgical Drama of The Three Kings, Early American shape note songs and music of Samuel Barber, Morton Lauridson, and others. Henry Purcell’s Dido and Aeneas, performed at the Hudson Valley art stonescape, Opus 40. Read a review here.